A BCS Championship Ticket Went for $1,500! Already…The Shape of Things To Come? Last week I updated our coverage of 2012 BCS Championship tickets with the most recent secondary ticket market prices, which are already crazy high and shaping up to be just as insane or even more insane than they were last year. It is a bit of an older post so I wanted to summarize some of the main points here. Enjoy and make sure to check out the original story for more details. Note that the sample size this year is pretty small so far, but I will continue to update as more data comes in, which I expect to pick up now with that start of the college football season. You can see that even the BCS championship face value ticket prices are really high, but they actually might be under-priced. 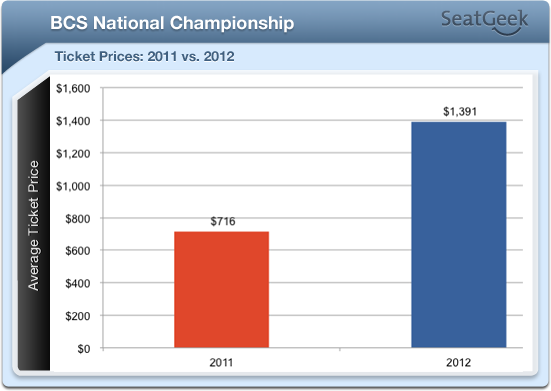 If you look back at last year people were willing to pay $1,351 on average to get to see the BCS championship live. If the early indicators prove to be true, this year’s face value prices are going to be grossly exceeded when the market price works itself out in the month’s leading up to the game. How much would you pay for to go to the national championship game? Who do you think has the best chance to come out on top this season? Please share in the comments below, or get in touch with us on Twitter @SeatGeek.com.